A.P. 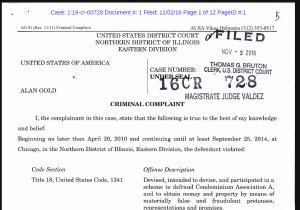 Gold Realty charged with $900K condo, HOA fraud scheme in Chicago - Association Evaluation LLC. Another condo association Management company owner has been charged with fraudulent theft of fees from at least nine condo associations in the Chicago area. Alan P. Gold reportedly had signature authority on Edgewater Condo Association accounts, but allegedly misused that authority to overpay himself for management services and other services not rendered. According to reports, thefts occurred between 2010-2014. AP Gold Realty and Management’s license was revoked in 2014. According to the criminal complaint, AP Gold may have managed up to 600 units located in 50 different client associations. Condo association fees were deposited into nine different bank accounts, of which seven were under the sole control of Alan P. Gold, as sole proprietors of his management business. Also according to the criminal complaint, up to nine victim condo associations (VCAs) allowed Gold access to both their operating and reserve accounts for their respective associations. VCA board members report not receiving copies of actual bank statements for years. Gold was in the habit of providing after-the-fact “owner statements of account” to condo board members by U.S. Mail. For example, in one association, the complaint notes that 22 “owner statements” reported inflated bank account balances and omitted multiple withdrawals that were made from both the association’s operating and reserve accounts. The discrepancies were discovered in 2014 by the Treasurer of one VCA, who compared the actual bank statements with owner statements that had been mailed to him by Gold. Charges in this case include mail fraud. If convicted, Gold could serve up to 20 years in prison. This case is another reminder that owners should never defer unsupervised control of finances and bank accounts to an association manager or any one individual. Furthermore, at least two board members must obtain signature authority over all association bank accounts, and all board members should be receiving original bank statements for monthly review.